Before I launch into the debut album from one of Canada’s best heavy metal exports in the 1980s, I have to confess that my brain hasn’t been in gear this past week. I can’t believe that when I compiled my compilation album of music stars who died in 2016, that I left out Rick Parfitt from Status Quo. 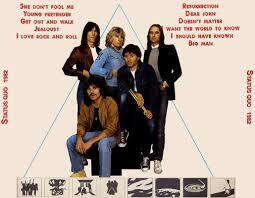 Therefore, to rectify this major screw up, I would add two Status Quo songs on it. 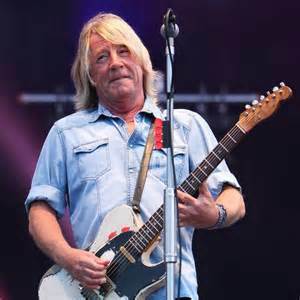 One from the “1+9+8+2” album I posted about, the song being “Want the Whole World to Know.” The other, the one I consider the better of the two songs a corporate record producer would use: “Rocking All Over the World.” Rest in Peace, Rick Parfitt. Onto the debut album from Canada’s own Lee Aaron. Now, something else that the music websites say I got wrong. It seems that this album didn’t come out in 1983. Originally it was released in 1982 and re-issued in 1984. However, I got this on cassette as part of a double album set with Lee’s next album, “Metal Queen.” Anyway, I thought for sure that it said on the cassette that the “Lee Aaron’s First LP” was copyrighted in 1983 and have had it in my noggin for over thirty years that it came out in said year. Since it’s too much trouble to go up into my attic and dig out the cassette to check, I must ask for clemency on any misrepresentation of this album. Now that’s over, let’s move on. I remember reading an interview of Lee Aaron in 1987 where she said she laughs when she hears this, her first album. I can see where she is coming from. Back then she was brand new to the industry and rather naive and listening to the album, one can probably say that if she had more say on the album, it might have sounded different. She only wrote on four of the songs. Lee, I hope it wouldn’t have sounded too much different because this first LP really rocks! While she might slightly blush over the lyrics of the tracks, “I Like My Rock My Hard” and “Should Have Known,” hell, I blush for her but they are still good sounding metal songs. In fact, I have to take my hat off to Rik Emmett of Triumph who produced the album. I always thought he did a good job of taking Lee under his wing because I can’t fault any of the tracks on here. Her vocals are just phenomenal and there are some good musician work to accompany those vocals. Though I can’t ascertain why Rik only played on one song, the opener, “Under Your Spell.” Stand out tracks for me are “Night Riders” and “Took My Heart Away” to begin with. Her cover of the famous Willie Dixon blues classic, “I Just Want to Make Love to You,” which has been covered by so many bands is one of the best. Before, I heard her version, it was Foghat’s version I liked but now there’s a power struggle in my brain. However, my favourite tracks on the album are definitely “Texas Outlaw,” where she doubles with Buzz Sherman and the closing track and even though it’s only on the 1984 re-issue, I’m going to include it here, “Under the Stars.” This track is recorded live and makes me regret never seeing Lee Aaron live. So, while she might laugh at this album, I really like it. Like I said, Lee Aaron might have been embarrassed about her first album but I’m sure not. It is a good rocking album even if the lyrics of some of the songs on it do sound a bit childish. Still, you can’t fault her fabulous vocals and the musicians Rik Emmett put together to make this fine album. One of these guitarists will stay with Lee but you’ll have to wait to her future albums before I sing his praises. In the meantime, enjoy this one. I suspect everyone thinks back to a classic song they haven’t heard in ages and then that song remains in the head for ages after. For me that song has been the title track to “Stone Blue” by the great Foghat. As a result, for the past week I have been singing to myself over and over the chorus, “Stone blue, but rock and roll sure pulled me through.” Great lyrics to a great song from a fine album. “Stone Blue” has more of a bluesy sound compared to the more rocking albums like “Live.” Then again, I have been told that Foghat have always been a great live band and I regret never having seen them. However, it still show cases the talents that make up the members of Foghat. As I post, another song from this album is now running through my brain housing group. I’m now singing the lyrics to “Chevrolet” not out loud of course. This shows what a good album “Stone Blue” is. The songs come back to memory very easily and let you know the legend that was Foghat.